"Baby it's cold outside - featuring snow"
With this theme I took the opportunity to get a head start on this years Christmas cards!!! Unfortunately last month some entries that did not follow our rules and had to be disallowed. Just love that snowman! Gorgeous card. You are Queen of CAS my friend. Awesome colouring as usual and your ahead of your 2013 Christmas cards already. You go girl! Stunning!!!! Your ability to use light and shadow is phenomenal. Oh wow you make the colouring look so natural... Fantastic, classically simple card. Hi Jane and a belated Happy New Year to you! I love your card and your snow colouring is ace, such gorgeous inspiration as always and your scenes always make me feel that I can step inside. I like the clean and simple look too, it brings out the image. YOur amazing colouring knocks me out Jane - and the fact you have started next years Christmas cards! That snowman looks so cool Jane (pun intended LOL). 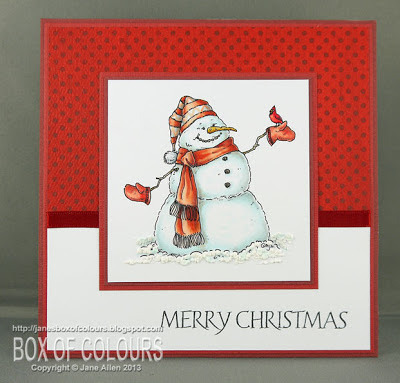 I love the textured snow and you picked such a great way to layout the design. Hugs! wow! beautiful coloring and i love the simple design. fabulous card!